In my It's Finally Friday blog post I said that I wanted to go and watch Mr Peabody and Sherman at the cinema. Well my parents agreed so on Saturday I went to see it. YEAH! Mr Peabody is a dog. A very clever dog. A dog who can do everything. Sherman is a boy. A boy adopted by Mr Peabody. A boy starting school. Sherman meets mean Penny and reluctantly lets her go in his time-machine. From there problem strikes and Sherman, Penny and Mr Peabody need to work as a team to solve the big problem. Can they do it? I LOVED this film. Zard* funny. I heard about 20 laughs throughout the cinema (don't worry children if you don't understand them all - I didn't. 'Hee Hee ha ha, I don't get it.' It helps see history for real on the big screen in a ridiculously hilarious, brilliant way. This film is a must-watch for anybody with a great sense of humour, someone who likes funny films, somebody who likes history or science or anyone else. I'm basically saying EVERYBODY needs to see this. An essential in life!!! 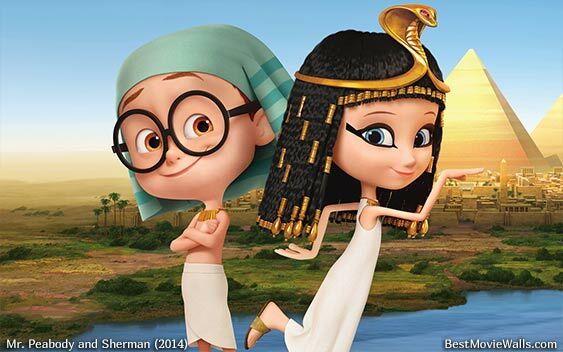 My favourite place time they went to was Ancient Egypt as it was really funny and you could see that Sherman does actually care a lot about Penny. Also it was full of action and intensity. It is AMAZINGLY, FANTASTICALLY, SUPER!!!!!!! So book your tickets; now. *Zard is a new word I made up. It is used when something is extreme. E.g. That car is going zard fast. It would mean - that car is going extremely fast.